Please click "more details" for drapery length measuring instructions. One tie back per panel will be included if you choose to add tie back(s) to your order. 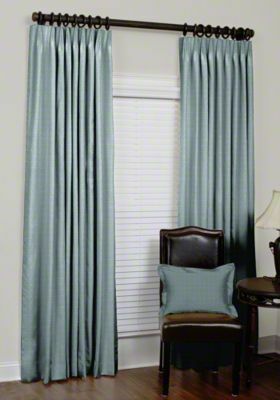 Create a relaxing and inviting indoor space with custom silk Euro pleat drapes. European pinch pleats are a variation of traditional pinch pleats where the pleats are sewn and then tacked at the top of the drapery giving modern pleats that open allowing a beautiful flow of fabric. Pinch pleat drapes are hand-pleated, pre-pinned and ready for installation. 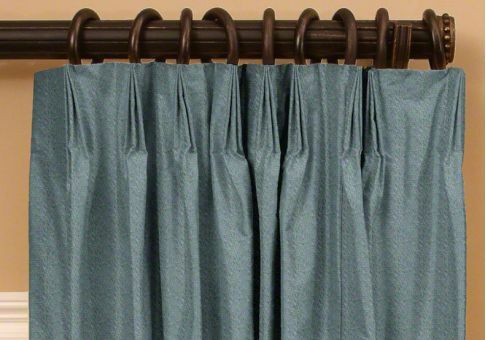 Our silk drapes provide a clean look when open or closed. The Euro pleat combined with any decorative rod and rings creates a contemporary or casual setting in your home. Silk color may vary from the sample piece received. The colors from shipment to shipment may vary between 5% - 7% and the dye lots are approximately 100 yards. Silk Dupioni has weaving irregularities like SLUBS, BARRES and LOOPS. These inherent characteristic give the silk fabric its unique appearance. Additional Information: Custom drapes are fan folded and placed in a plastic bag before shipping. Ordered when a mirrored pair of panels is required for installation. This option is normally used when selecting left and right drapery panels for a window. Ordered when a single panel is required for installation. Next select right, left or center depending on which direction you will want the drapery panel to open. There is a one-time (per order), non-refundable $25.00 charge for the handling of your material. Please be sure to read our important Customer's Own Material (COM) Procedures. Fabric requirement estimates will be shown in your cart and on your invoice. Coverage Area - Measure the width of the area you want to cover. If ordering pleated drapery, consider adding 4" - 6" on either side of your opening to maximize natural light and provide the best finished look. Note: We have made allowances for fullness, returns and overlaps as needed to ensure a beautiful finished look. If ordering drapery that does not need to close (stationary), consider ordering a drapery with less coverage. 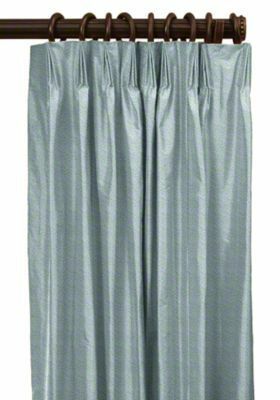 Typically, pleated drapes are used with drapery rings or a traverse rod. This style comes standard with drapery hooks set in the back of the panel for installation purposes. To get an accurate measurement, you'll need to know which hardware you will use before measuring for your drapery length. Refer to the drapery measuring diagram on this page. 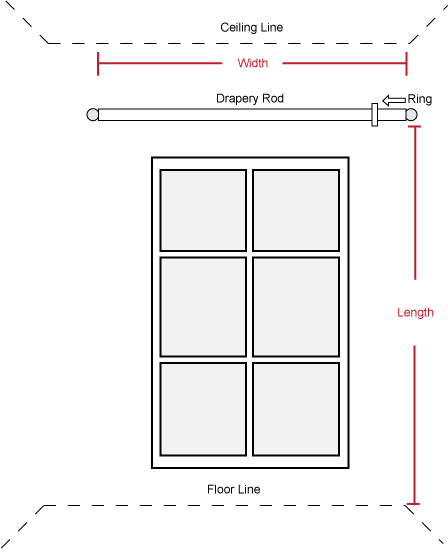 Standard Traverse Rod: Measure from the top of the drapery rod, to the floor. Pleats will hook into carriers that are not seen, and the pleats will cover the drapery rod. The return is the measurement from the front of your drapery rod to the wall. Measure the depth of your hardware brackets to determine your required drapery return. Note: A 3.5" return is most common. This lining is easy care, water repellent and provides long-lasting drapery protection. It is ideal for humid areas of the country. 100% cotton. Available in white or ivory. Optional interlining. This lining is easy care, and water repellent, which makes it a great natural choice to protect your drapery investment. 100% cotton. Available in white or ivory. Optional interlining. This is a coated lining with a soft hand. It provides sun protection, insulation and blocks out light. 100% polyester. Available in white or ivory. Interlining not available. This lining has a napped finish on one side and a sateen finish on the other side. It provides an economical option for the traditional lining plus interlining. This lining also delivers sun protection, insulation and light blockage. 100% cotton. Available in white or ivory. The placement of interlining is between the face and the lining fabric. It provides cost-saving insulation, as well as adds body and a substantial look. 100% cotton. Tie backs are made 3" wide. Tie back length is made according to the width of drapery ordered. A hook pin set will be included in the seam 1" from the end of each tie back.